Macro data buoys markets. The stock markets rallied 1 per cent on Monday as banks take lead hoping rate cut opportunity following low inflation numbers. Mumbai: The stock markets rallied 1 per cent on Monday as banks take lead hoping rate cut opportunity following low inflation numbers. Snapping losses on the two straight sessions, buying activity taken-off drawing support from macroeconomic numbers - July industrial production up 4.2 per cent, WPI inflation lower (-) 4.95 per cent in August. Notwithstanding, the analysts feel that the markets are still restrained and looking at the US FOMC meet scheduled during this week. 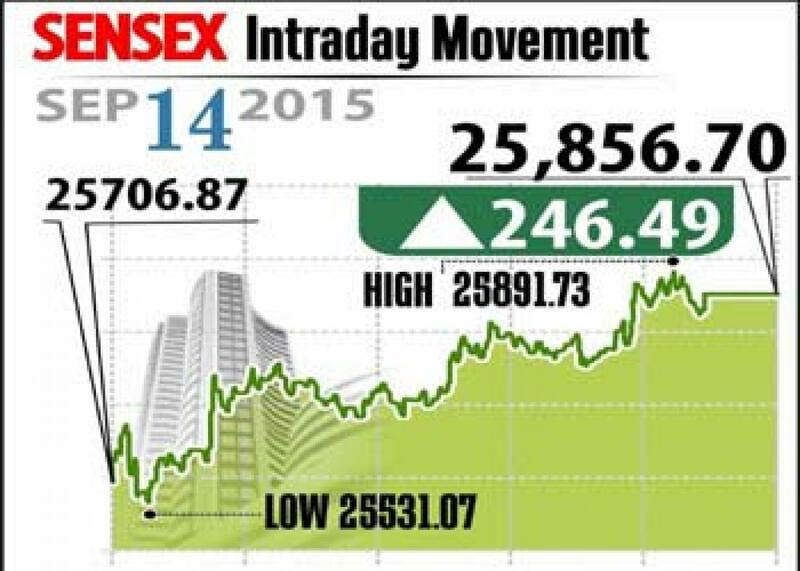 Sensex closed up 247 points at 25,857 and Nifty gained 83 points to end at 7,872. Meanwhile, the broader markets closed in line with heavyweights with midcap and smallcap indices closed higher by 1.3 per cent and 0.9 per cent, respectively. On the sectoral front, excepting the consumer durables index, all other indices closed higher with power and metals surging 2.5 per cent. Also rate sensitive stocks gained as investors hope for a rate cut in the next policy. Banking space, Axis Bank, ICICI Bank, HDFC, HDFC Bank and SBI increased up to 3 per cent. From realty pack, Oberoi Realty, Sobha Realty and HDIL zoomed up to 5 per cent. Technology stocks rallied ahead of US Fed meet as rate hike will strengthen dollar. Wipro, Infosys and TCS gained between 0.2 to 3 per cent. The gainers: NTPC, up 5.06 per cent at Rs 125.55; Vedanta, up 4.02 per cent at Rs 101; Tata Steel, up 3.54 per cent at Rs 241.30; Hindalco Industries, up 3.42 per cent at Rs 78.70; and Axis Bank, up 3.05 per cent at Rs 496. The loser: Bajaj Auto, down 0.35 per cent at Rs 2,310.50.